← A Kiss for You by Dianne Powell-Eddings Book Blitz – Win a $25 Amazon Gift Card! Shutting Up by Eric Wagner Book Blitz – Win a $25 Amazon Gift Card! Hey, manager: please shut up already! Too many new managers, often promoted from the best of the front-line workers, lack the basic ability to interact effectively—speaking when they should be listening, and listening… well, not much. And when it comes to more advanced skills like improving worker performance, maximizing productivity, handling customers, and driving real success with their products, all bets are off. With no real background or training in management skills, today’s managers—even with experience—too often struggle to engage with their teams, maximize performance, and achieve great results. Here’s the newer manager’s greatest ally: a quick-start guide that rapidly and accessibly covers the essential skills that good managers need to lead their teams effectively. 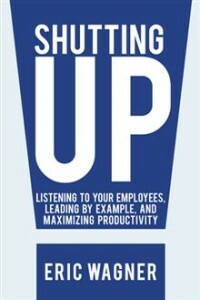 Building on the simplest possible foundation—Shut Up and Listen!—this guide collects over 250 hints, tips, and tricks developed by an experienced manager and leader over more than a quarter century of technical management. Take your management career from zero to sixty—or discover how to lead your team to the next level—with one quick and easy read. Eric Wagner is the President of MindNest LLC, a technology incubator in Phoenix, Arizona. After beginning his career as a software engineer, he quickly rose into the ranks of management, where his style of listening to his employees, leading by example and consensus instead of decree, and finding simple ways to maximize results soon led to positions of greater responsibility at internationally-known companies Autodesk and GoDaddy.com, culminating as the CTO of Pearson Digital Learning, a division of the world’s leading academic and educational publisher. He regularly travels nationwide to appear as a keynote speaker at technology and educational events. Eric holds a Bachelor’s Degree in Computer Science and a Master’s Degree in Software Engineering from Arizona State University. Eric is giving away a $25 Amazon Gift Card!